Letna Apartment DVD Collection: Waiter, Scarper! As you may know, we have a cool, newly refurbished rental apartment in the Letna district available for rent. However, the apartment goes beyond providing mere accommodation. We have conceived it as more than just a place to store your luggage and sleep in during the night. We want our guests to get immersed into the Czech local culture and society, to get an insight into how the locals live and how they think. In short, we want our guests to understand the Czechs. That is why the apartment includes many audio CDs and films on DVD that will help them understand the "Czech experience" in the 20th Century and at the beginning of the new Millennium. In a series of posts, we will be introducing some of these films and albums because we think they would make for a cool souvenir that truly goes beyond mere tourism and we do not want to keep the movies that we love to ourselves and the guests that visit our apartment only. The first movie we will write about may not seem like the first candidate (having won no Oscars and so on) but if you talk to any Czech, they will be able to pull out quotes from that movie on the spot and confess it's one of their favorite movies of all times. We used to give this movie on DVD to our guests on the tour as a present, until we bought off all the cheap copies originally sold as an insert in a magazine. We do not know if any of the guests have actually watched it, but we still think that the movie is a great window into the ordinary lives of Czechs and Slovaks under Communism in the early 1980s. The plot is very simple [spoiler alert! ]: Mr Vrana, a book seller, is a victim of his own sexual fantasies. Even the title sequence, in which women in bathing suits swim in a pool, turn out to be the creations of his imagination. And Mr Vrana is not afraid to act on these fantasies. This has a sad effect for Mr Vrana: he has to pay a lot of alimony payments to various women around Prague. In a desperate attempt to get more money, he begins posing as a fake waiter cashing bills in restaurants and cafes in Prague, and later throughout Czechoslovakia. Now, we have to set one thing straight right away: this is not drama - this is a laugh-out-loud comedy. We see the main character first getting mistaken, by a mere coincidence, for a waiter in a motorway restaurant, then seeing him embarrassed when comparing his life to all his successful classmates at a high school reunion, and finally the first, shy tryout "jobs" in a few restaurants. What follows is a transformation into what becomes known as the "Phantom of Restaurants and Cafeterias" (to explain: "Restaurants and Cafeterias" was the quite apt name of the only company in communist Czechoslovakia that owned and operated… you guessed it… all the restaurants and cafeterias). He has to hide his "side job" from everybody, including his friends and family, and, of course, the police. This leads to many funny situations, especially as he keeps bumping into his rather obnoxious and nosy neighbor. We won't spoil the ending for you, you'll have to watch it for yourself. While being primarily a comedy, this film offers a serious glimpse into a much larger problem that has plagued the Czech and Czechoslovak society to this date: corruption and back-hand deals. After the Soviet occupation, it seems that the people turned to themselves and just focused on playing the system and the black market to their own advantage. The aim was to take and to take. A very popular saying at the time proclaimed that "who does not steal from the state, steals from his own family", and, unfortunately, many people have failed to abandon this policy after the old regime collapsed. There is a perfect scene in the movie where the main character twists a very popular fairytale (pigs in the rye) to his children: the pigs who disobeyed the orders and ate the rye were killed. But so were the other pigs, and the pigs who ate the rye could at least say they got a taste of the rye. Get rich or dye trying. Consider the following scene (please fast forward to 8:20 in the video): at a high school reunion, an old classmate explains how he makes big money by striking backhand deals and bribing his suppliers. We are proud to be independent ourselves and are strictly against any bribery and backhand deals, but we are afraid half of the tourist industry here in Prague still works along the same lines. Anyway, the movie is a real gem and we definitely recommend it (heck, that's why we chose it for our DVD collection in the rental apartment). If you decide not to stay in our apartment, you can still buy it on DVD with English subtitles (which range from inspired to just ok). We probably recommend the Bonton store at the bottom of the Wencesas Square. Enjoy! 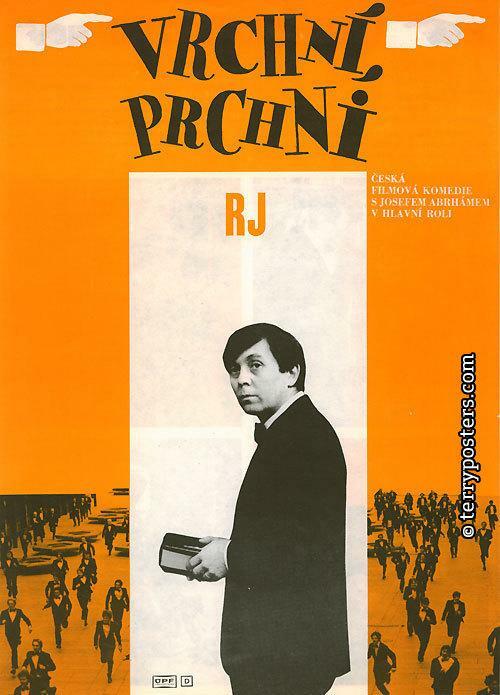 Have you seen a Czech movie you liked? Let us know!